It was May 12th, 2016 the day Ozzy Osbourne and Corey Taylor gathered the masses for an unprecedented event. Media outlets were speculating, what the whole buzz was about, and only the metal world had an idea of the purpose of this top secret assemble. Due to recent news of Sharon and Ozzy Osbourne’s separation, media outlets were hoping to hear a bit about those details, however, Ozzy and Corey went straight into business! Sharon Osbourne has been the manager of Ozzy Osbourne’s career for some time now, and she has been brilliant and a great entrepreneur. The host of the event, which took place at the Hollywood Palladium, was none other than Jose Mangin, heavy metal ambassador and Sirius XM Liquid Metal host. He delivired the amazing news that a new festival is to take place on September 25th and 26th at the San Manuel Amphitheater in San Bernardino: Ozzfest Meets Knotfest. For those of you who have never heard of either festival, we’ll just put it this way…. this combination is a slap on the face with balls of steel on the Coachella Festival. Now don’t quote me on that, as everyone has different tastes in music, but I do stand on my words! It will be a festival where people will bleed. Yes they will bleed metal, as bands like Megadeth, Anthrax, Slayer, and Death Angel (which happen to be the best trash metal acts today) will perform and expose the world to their relentless guitar riffs, drum blast and adrenaline driven metal. Slipknot and Black Sabbath will be the headliners for this event. On September 25th it will be the Ozzfest- meaning Black Sabbath will headline that night. The following day, Slipknot will headline the Knotfest. If you have not yet jumped off your chair and landed on your rear, then you sure have no idea what you are reading about! Nonetheless, Corey Taylor and Slipknot has been playing at Ozzfest for the majority of their festivals, which makes this more meaningful to both Ozzy and Corey to finally do this merged event. 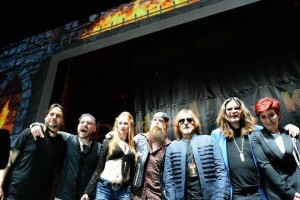 The Palladium was not ready for what was about to take place soon after the press conference; Zakk Wylde performed Black Sabbath songs with his Zakk Sabbath band. Of course Zakk Wylde was Ozzy Osbourne’s guitarist some time back, and knows each and every song written by Black Sabbath hence his epic cover of “Wicked Woman” and “Black Sabbath” among some of the great classics of Black Sabbath. The day had already given us enough to talk about- with members of the forthcoming festival being present like Corey Taylor of Slipknot, Ian Scott (Anthrax), Zakk Wylde (Black Label Society), and David Draiman (Disturbed)- but then Zakk Wylde decided to include Corey Taylor in his performance and destroyed the stage with “Sweet Leaf.” He also invited David Draiman of Disturbed to join him on stage for another song. The set was very intense and filled with Zakk Wylde’s unique guitar solos incorporated with Black Sabbath’s songs. The show left fans speechless, as did the news of Ozzfest Meets Knotfest. The metal world will be shocked with this stunning line up and San Bernardino will be set ablaze with such brutal music.